Info "Elephants use their trunks to bathe, greet each other, and... do your bidding!" Junk and My Trunk is one of Young Cricket’s Microgames in WarioWare: Smooth Moves. The player will be controlling an elephant's trunk. The player has to move the apple to the basket. How the player has to do it depends on which difficulty level is on at the moment. 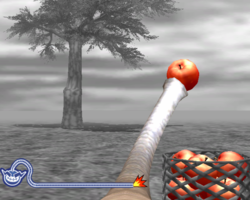 1st level difficulty: The player has to place the apple in the basket. 2nd level difficulty: The player has to pick the apple then place it in the basket. 3rd level difficulty: The player will have to collect an ascending balloon and give it to a woman. This page was last edited on March 28, 2018, at 21:40.